Knowth - A Virtual Tour - Bryn Coldrick. Spirals within Spirals: Stones have Stories to Tell - James Nemec. Knowth - Secrets from the grave - an article from The Irish Times. Knowth by Jeffrey May - an article from Current Archaeology. Megalithic Art at Knowth - from Minds or Moons? - Laurie Darcus. The Ritual Origins of the Roof-Box at Newgrange - Laura E. Freeman Marr. 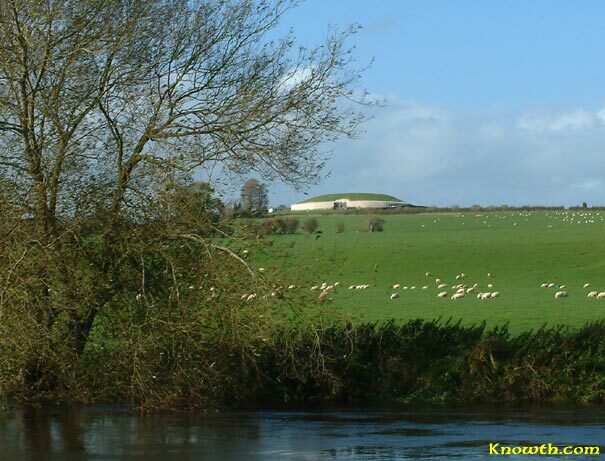 Newgrange: empowering the salmon of wisdom - Philip Coppens. The Bull of Newgrange: a metaphor for Halley's Comet? - Gilbert de Jong. Newgrange Excavation Report Critique - Alan Marshall. Aspects of Ritual Deposition in the Late Neolithic & Beaker Periods - Charles Mount. Brú Na Bóinne - Heritage Tourism Sustainability - Bettina Graham. Ireland's burial mounds hold many mysteries - Jim Sajo. Computing the Winter Solstice at Newgrange - Rick Doble. Reflections on Loughcrew and Newgrange - Tim O'Brien. Loughcrew Equinox Reflection - Sally McKenna. Stonelight Archives - Pioneering research of Martin Brennan. Ireland in prehistory - A concise account - Desmond Johnston. Some Thoughts on the Celts - Origin, Religion and Language - Desmond Johnston. Aspects of the Megalithic Era - Desmond Johnston. Fourknocks - An interpretation - Martin Dier. Messages from the Monuments - How Neolithic Monuments Communicate About Religion and Status - Paul K. Wason. We Have Never Been Material - Andrew Cochrane. Monuments and Access - The interpretation of Neolithic Monuments - Dr. Liam Kilmurray. Cairnpapple Prehistoric Site - Scotland - Jackie Queally. Vale of the Boyne and Royal Meath - published in 1898 for the Great Northern Railway Company. The Valley of the Boyne - from 'The Charm of Ireland' by Burton E. Stevenson, published in 1914.